Early in her career, Terra's Cindy Tyler keenly recognized the importance of reconnecting children, and their caregivers, to their green world. "It is my firm belief that children will only protect what they love, and only love what they know." After decades of design commissions that create natural playspaces for families, we reached out to a few key clients to capture the essence of why this is so important. The following video is a testimonial to our passion and commitment to family gardens! 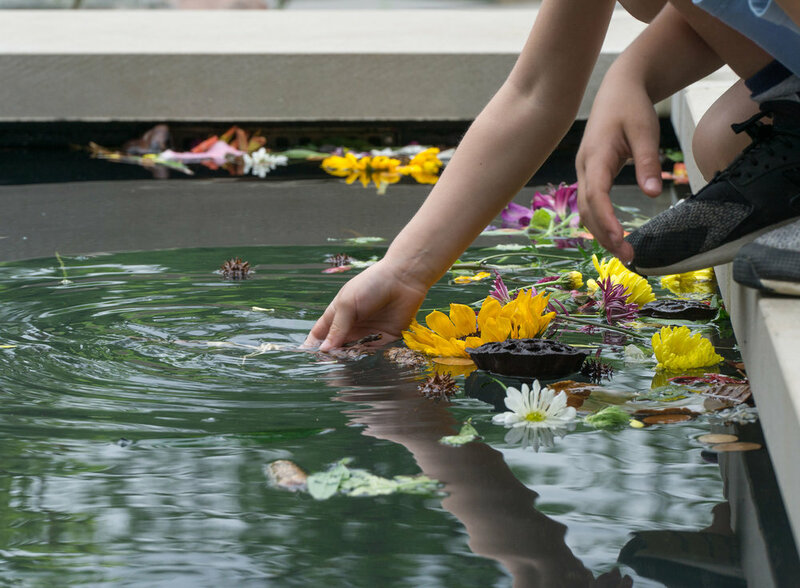 Franklin Park Conservatory and Botanical Gardens captures a succinct ten acres of indoor and outdoor gardens and public art displays within an 80-acre beloved urban park in Columbus, Ohio. It is a leading cultural destination for the region. The Gardens’ decision to build a family garden was borne by a strong desire to offer unmatched hands-on opportunities for children and their caregivers to reconnect with their native Ohio landscapes. Terra Design Studios, along with our team – Design Group, Korda Engineering, and HydroDramatics – designed a two-acre garden that perfectly aligns with Franklin Park’s core values. The project kicked off with multiple workshops with local elementary students and their families, Gardens’ staff and Board members, and donor groups to learn how the Columbus community envisioned their family garden. “Celebrating the Ever-changing Magic of the Ohio Landscape” emerged as the garden’s tagline, and we created thirteen distinct garden galleries to support this theme. Unique aspects of the Children’s Garden include a dramatic sandstone bluff, interactive creek and created woodland, called My Ohio Woods, which emulates the beloved landscapes of the Hocking Hills region of Ohio. Earth art is woven throughout the Garden, anchored by a Nature Art Studio for led programming to transform STEM initiatives to STEAM. And ten local artists added their own creative touch of beauty and magic, evidenced by the Sunshine Celebration Arch, Whisper Bench, and much more! The Children’s Garden opened in May 2018 and is receiving national and international attention. The highly anticipated Family Adventure Garden will create an exciting new environment that will feature interactive elements to encourage children’s curiosity in the natural world. Terra worked with the Natural Learning Initiative and Ten Eyck Landscape Architects to design for both education and fun. Elements within the Garden will encourage children to observe, understand and experiment with patterns and cycles in nature, cultivating the curiosity and connection with the natural world that studies show make children healthier, happier, and smarter. Activities will be both directed and self-directed, allowing children to not only learn through planned activities, but to use their imaginations for play. The Garden will also encourage children to use all five senses and discover while playing. A variety of nature play opportunities are located in each of the twelve themed gardens, from rock hopping to fort building to roleplaying as an armadillo! Additionally, docents will be trained as play coaches to encourage interaction between children and their caregivers. No other family destination in the San Antonio region offers this kind of interactive environment with a strong educational underpinning. Water, wildlife and hands-on activities will be nestled amongst showcase gardens where people of all ages and physical abilities will be welcome to explore the amazing journey of a Texas raindrop, learn how plants and animals support each other, and forge a personal connection with nature by divin’ right in! With the goal of enriching their city campus and expanding outdoor educational opportunities, Winchester Thurston School called upon Terra Design Studios to rehabilitate their Lower School’s courtyard spaces. Terra worked closely with school architects, MacLachlan, Cornelius & Filoni, and school staff to develop design options which maximize educational and play opportunities within a limited space and maintenance budget, while meeting current accessibility and national playground safety standards. The target play and learning age of children attending the Lower School ranges between Kindergarten and 3rd grade. Play and motor skill development zones were created to encourage open-ended play that embedded traditional play equipment among themed pocket gardens, including bird and butterfly gardens, edible garden, a music garden, vine tunnels and bug boxes. Nutrition and life sciences were also important topics to the teachers, resulting in a hands-on gardening zone where children can grow their own food. Thermometers, rain gauges and rain barrels encourage discussions on the weather, and the playhouse’s green roof supplements the story of pollination told in the butterfly garden. Using the pocket gardens to serve non-traditional curricula such as art, math, social studies, and reading was also an essential goal. Plantings will be change annually in the storybook garden to feature a special tale, and color, texture, and forms throughout all the pocket gardens will inspire young artists through all seasons. Built on two and a half acres adjacent to the Denver Botanic Gardens’ main campus, the visitor experience begins on the top of the Gardens’ two-story parking deck, offering a dramatic first impression and sufficient topography to showcase the altitude-sensitive ecosystems of the Denver region. 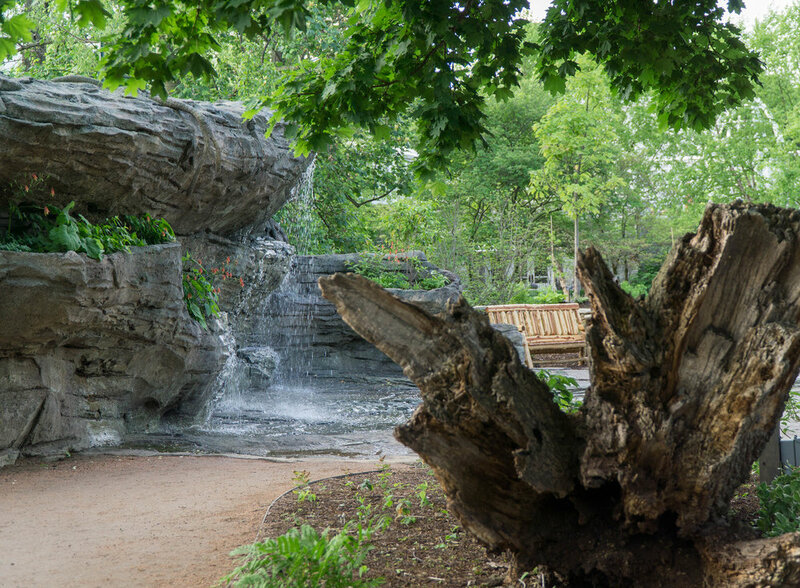 Towering geological formations, amazing trees and crystalline streams are captured in more than seven child-size garden galleries. While visiting the garden, caregivers are also invited to play, while given clues to query their young charges about what they are seeing and doing. This simultaneous interaction creates meaningful nature-based experiences that transcend the garden gates. MBBY appeals to the kid in all of us. Exhibits inspire grandparents, parents, and teachers, to replicate the joy of outdoor play experienced at MBBY in a child’s daily life. It is through this unscripted play that children will come to know the essence of the earth and become the next generation of trustees of our green world. Prior to 2006, Wegerzyn Gardens was a sleepy part of the Five Rivers MetroParks. That all changed when the Discovery Garden opened its gates. An average of 600 people a day flock to this one-acre gem during the Garden’s season to explore miniature Ohio ecosystems, gather ideas for their own backyard gardens, and sow, nurture and harvest as a family in the Hands-on Garden. In the Ohio Natives gallery, children and their caregivers immerse themselves in an Ohio woodland, complete with fruit-laden paw paws; a limestone cavern and interactive stream; a flourishing wetland and pond; and a vibrant prairie. The region’s first public straw bale building houses a charming family-style restroom while its green roof buzzes with pollinators overhead. The adjacent Sensory Garden welcomes all with a particular focus to serve children with physical challenges.